It's been over three months since the last issue of QB Express, but I think this issue more than makes up for it! We've got NINE articles for you this month, covering everything from "The Art of Rounding" to FMOD, to Spring physics programming in Freebasic. We also have one of the biggest NEWS BRIEFS sections in QB Express history. You guys have been busy the past few months, and hopefully this issue will reflect that! You will definitely enjoy this issue. All submissions and feedback can be sent to qbexpress@gmail.com. You can also PM me on the Pete's QB Site or QBasic News message forums. If QB Express is going to continue to be so good, YOU need to contribute! For a start, i want to say now i know what it is to build up an issue like you have done this far. Took nearly 10 hours to build up last issue of PCopy! And no double pay from a excess hours :D Never been this hard and there is still lot's of "bugs" i need to fix. "User Oriented Programming" by Stéphane Richard was also a good one. I really love the way he writes. Even jerk non-nerd like me can understand easily the points of a things which are not familiar before reading. To mention here, i think Rick D. Clark has that same ability to write tutorials in same way. Hopefully we see much more hes tutorials in future. "Angles in 2D environment..." by Lachie Dazdarian were something i got help. I dont care much about these things normally but this one helped me to resolve one hard bite i had with one ascii program. To be honest, i didnt give much attention to first part of this tutorial, but now i got so interested that i read them both for a few times. For final, i want to make a wish for all FB forum users. Could you please mention a target platform if youre offering something like "file.zip"? If there is compiled file, say for what platform it is and if youre offering a source too, please mention if its only for windows? I dont mean that this is a big deal, but it just irritates time to time. I am happy to see QBE is now back for good. It takes lot's of time and energy and time to time there are nasty peoples complaining how it's done so wrong. It is life, what you can do about it? I wish all the best for all of you contributors and editors. Let the future of QBE be bright and great. You're sure right that putting together a QB/FB magazine is a lot of work! I've already put in nearly a full day on this issue alone...and I don't mean a "9 to 5" day -- I mean 24 full hours. Finding a spare 24 hours to put together a magazine is tough, considering how little time all of us have...though I do believe the end result is worth it. Good luck with PCopy! You have certainly surpassed QB Express, releasing two issues in less than the time it took me to put together one. Hi everyone else but me ;-) (I know, a ridiculous attempt at hiding my insanity lol). QB Express #25, count them, 25 issues so far. What a great number that is. Getting closer to 50 releases guys. One of the greater things about that is that with 25 releases behind it's back it's no wonder QB Express is where it is today. Needless to say I'm one of the happier ones here of that fact. 25 issues is quite an achievement for QB Express, a magazine that started off in a community and a language that was essentially dead or dying. Pete always said it, QB Express is a magazine created by the QB community, for the QB community. So although QB itself was on it's way out, QB Express was bound to survive because it was about the people, not the language. It could be called COBOL Express it would have survived too with these kinds of goals hehe. I think this is something some people *cough* pritchard *cough* would do well to remember, forget the name, the language the name is related to, QB Express is about the people. They didn't know QB Express existed before I sent them there (Some didn't know FB existed either). They didn't just read the article I pointed them to, they ended reading the whole issue and the other issues too. They enjoyed the read hoped QB Express would go on with many more new releases. Most Importantly, the really liked the fact that a community had it's own magazine, they thought highly of the people of this community because they could stand together and produce something like QB Express. I think this says a lot about what QB Express is already and has the potential to become. If these 9 to 10 people start spreading the word around, you get where I'm going with this? And that's from people completely outside the community and even some from outside any BASIC dialects. This is what happens and when I tell people QB Express has been happening for about 3 years, their jaw practically falls off but in a good way, for us at least, they have drink juices and eat Jello for a while after. Now if QB Express has that kind of impact I think that at that point I understand why Lachie and maybe some others want QB Express to be “up to par” so to speak. Because of that impact on the outside world and the impact it has on the inside world of QB Express too. Why? Because QB Express represents it's people as well as it's contents I believe. Now, notwithstanding the possible spelling and grammar errors, I think that the contents of QB Express #25 were very interesting. The news briefs are always one of the first things I check to make sure I didn't skip over anything. And well I did skip something because I didn't know about notthecheatr's font library that he released. I'm glad I know about it now though. Hehe. I think it's one of the first things that a lot of readers like to take a look at too. I know it impress at least a couple of the 9 or 10 that I sent to QB Express. One thing I noticed about the last few issues is that things are taking a turn in the community. Articles like Deleter's “Multi-faceted nature of games, the dream, the design and the reality” are a perfect example of that and so is my User Oriented Programming article. It seems that the people are attacking not only programming challenges and techniques as is typically expected from an E-Zine, but people are also concerned about helping the success of programming projects both on the side of helping people by giving them tricks to stay motivated and finishing the projects but also on the side of helping people make games and programs that the users/players will love to play with by paying attention to how the features are presented and accessible to the users. Not sure how many people read Deleter's article but if they've given up on one or more projects for whichever reason, perhaps a reread of his article is in order. Great work there Deleter. I also think there should be more articles like notthecheater's “Accessibility and File Names' which maybe he should have written in all lowercase characters ;-). FB is multi platform. Case sensitivity of file names is but one thing to consider when creating programs that is destined to be executed on more than one platform. I think a collection of discrepencies such as case sensitivity and path/file access rights and other things should be listed and considered in a complete “how to really be multi platform in your programming type of thing should be created, that's not just for FreeBASIC, but for any language that runs on more than one platform ;-). It would be a very useful thing to have indeed. Right down to adding some #IFDEF that do different tasks or load different libraries if needed in a given project. Really, anything that can and might be different on each OS should be in such an article. And how about that comic section this issue huh? I've never seem so many of them in one issue ;-). There's a lot of creativity in there and I for one love the fact that they are in a magazine like QB Express, that too shows the people outside of our world so to speak, what we're all about hehe. About the pirate ship, he forgot the most important thing on it, the FLAG no pirate ship I know of doesn't have a flag. And I had a hunch about COBOL that got confirmed in this comic about how COBOL came to be hehe. Dean Menezes “Fun with Recursion” I think is one of things to talk about. Not just recursion itself which is very useful in many cases, but just taking algorithms and explaining them. I think, if it's done right like it seems to be in Dean's case, that doing that, explaining them with a coding example is one of the greater ways there is to teach the subject to newcomers or people that do code but just never sat down and studied these algorithms. A lot of people just sit down and code, the hack at it until the darn thing works whereas if they would have known about one little algorithm that already exists they might have saved themselves hours if not days of coding so I would like to suggest that any algorithms that people can think of should be covered and submitted, just so they are there and known about. Great work Dean, great idea. When I read RubyNL's first contributions, I had a hunch that writing came rather naturally. So did explaining, detailing everything in such a way that they are just understood. And this issue's “peek and poke tutorial” and “sphere mapping tutorial” just confirmed what I thought in the past issue. As I said before it's written in a way that one just reads and learns. RubyNL should be a teacher in my book because of the way everything is explored and detailed. Examples are concrete and pretty easy to follow (for me anyways) it's just a brilliant piece of creative art to read. Great work there. Looking forward to anything other contributions. So RubyNL? Keep on writing, you got at least one fan and I'm sure there's many more that think like I do. I always wondered “how do you go about making someone understand what a particle engine is, what it's good for, how it works and so on”. 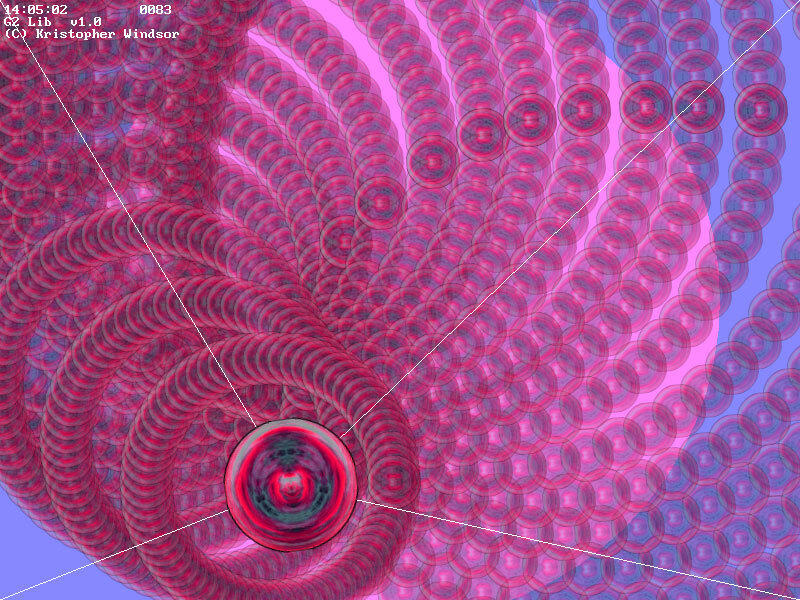 The way notthecheater did it is a way I didn't quite expect, I was thinking in the line of particle engine theories and so on first, bringing in examples after the basis are covered. Well, after reading notthecheater's tutorial on particle engines, I stand (err sit, technically lol) currected I think his way of presenting particle engines in his tutorial is very unique, direct, and effective. The examples start off simple and stay simple even as he modifies them in the latter part of his tutorial. Two thumbs up to him. I'm looking forward to reading part two. Great work. I wanna take time to congratulate Immortis on an excellent initiative. His QB Express formatting tool is an awesome idea that seems to be developed just as awesomely. Reading his article all about his tool also makes it seems very ease to use and a great help for those of us that love to format their articles (I won't mention any names hehe). I gave it a good try I happened to have two or three of the supported editors and they all seemed to work great and as expected with his tool. Fully automated no, like he said himself, but yeah, thinking about the QB Express “code” series of tags makes me appreciate his tool even more hehe. It's on my list of cool tools that's all I can say. Let's see now, we have sphere mapping, and then we have floor mapping (by Codemss). What a great lineup for anyone interested in 3D programming don't you guys think? I like how Codemss kept his tutorial as concise and to the point as he did in this 2nd installment of his floor mapping series. The knowledge is there, the technique is there, and even the programming example is there, what else is there to expect? Put all that code in an editor, compile it and voila, a working floor mapping program that works and from which we can expand on and learn from. It doesn't get any better than this. Lachie's second part to his “Angle in 2D and artificial smarts based on them” answered a few question that were raised when I read his first installment that's my idea of a good complete “series” on any given subject. The progression, the follow through of the basic ideas and concepts from the first installment into this second work makes it a great educative and informative read. Lachie, I don't know what you're gonna write about next, but I can't wait to read it. Keep up the great contributions and your commitment to keeping the community alive and “up to par” ;-) hehe. I know where you're coming from. And I've explained it at the beginning of this letter hehe. Mentat is one of the writers that weren't sure about their contributions in the past 2 issues. They tested the field and well I don't think he needs to wonder no more, he's a good writer with a gift for presenting the information in an interesting and intelligent way. I've been learning a lot from his writings he seems to be able to bring out the one magic sentence, that weren't mentioned in past articles by different authors on the same subject, that just seem to click with my brain. I'm sure I'm not the only one to think that too. Great write once again with your Acceleration, Velocity and Position tutorial. Awesome stuff, keep it up. Sure I maybe be the QB Express motivator, but I don't think it's just all about motivation per se in what I write. I think what I really try to emphasize is that every effort, no matter what level of effort it is, towards giving the community something that makes a community a community should be valued and respected. Look at the image it seems to be giving us to the outside world, that should say a lot right there. QB Express is one of those community strong points, so are competitions of course. And for the sake of repeating myself here as I have twice so far on the FreeBASIC forums I still think a community.freebasic.net should exist because the community is just as important as the product the community revolves around. In this case, it's FreeBASIC (and some QuickBasic too, hence the name in the first place). But without the people of the community, none of these would be what they are today. Nevermind the spelling and grammar checks, QB Express #25 was an awesome piece of work that still manages to live up to it's name and no established reputation in the community (and from what I'm seeing, outside the community too) so keep on keeping on, all of you. Another great release, that's the bottom line whether it's spell checked or not hehe. As for QB Express #25 being "sub-par," I agree with everyone that had that assessment. In fact, I was the one who originally used that term to describe the issue, before everyone else started using it as well. The problems with #25 were not so much in the content we did have -- but with the content we didn't have. I did a lousy job of collecting news briefs, and missed many important stories. We had new game reviews, there were no "Monthly Awards", no Competition, no new poll, etc. It's tough, because all of these sections take time and effort on my part, and I was in a rush to get the issue out before I went away on a trip. I made a conscious decision to release an unfinished issue, in the interest of getting it "to press," so to speak. With this issue, I've taken the opposite philosophy, and done a very thorough job collecting news briefs, and have made sure that all of the important sections are represented -- even if it has meant that it got delayed quite a bit. I hope people will notice the difference. (Although there is no poll this time around, because I did not put one up before hand.) Despite a weak showing in the "Articles" department, with no game reviews and only two articles, I think this is a much stronger issue. Hopefully when people see this issue, they will be motivated to submit even better content so that #27 is even better! Have a letter for the editor? Send all your rants, raves, ideas, comments and questions to qbexpress@gmail.com. Lachie Dazdarian has been doing a great job keeping the Freebasic Games Directory up-to-date these past few months. In December, the FBGD launched a new forum, that has attracted a decent number of users, and in the last two updates, Lachie has added ELEVEN new Freebasic games. He has also been keeping a "watchlist" of promising Freebasic games that will make it into the directory once they are finished. What's the deal with QB45.com? This Fall, the QB45.com domain name expired, and with it went Jofer's "Yeti" version of the site, which lived at the domain since 2004. Luckily, Marcade (best known for running NeoBasic), snatched up the domain to prevent it from falling out of the hands of the QB community. Now, rather than the extensive QBasic files archive and news resource we have come to expect from QB45, there is just a simple message board. The older QB45.com "Yeti" design; and the current message board. When he took over, Marcade opted not to transfer the "Yeti" version of the site to his server, or to resurrect the older "Future Software" version of the site. Instead, Marcade claims he plans to create an entirely *new* site, featuring the famous files archive and content from QB45.com. Marcade made this announcement in October, and since then, nothing has happened with the site. I have the best intentions for QB45.com. This means I want to put a site here that will last, like NeoBASIC has, for years. This means it should require no/little maintenance. But I also want to make sure it is simple and fast. Jofers did an excellent job on his Yeti site (geez, calling Jofers site King Kong version site !!. It is a bloody Yeti!! Yeti is way cooler than King Kong !!) .. but it is his site, his scripts, his idea's. In my opinion it was .. too big .. for qb45.com with only a few visitors. Whatever ends up here will be less complex, smaller. If you would want to get an idea what I mean, look at NeoBASIC and Plasma's Phatcode. These will be the inspiration. The reason I *snatched* QB45.com was not only to prevent it being run over by ads, but also to prevent some keyboard coybow putting up some half baked site. QB45.com has served it's time and I am here to give it a well deserved and proper retirement. There will be a decent site here. The Archive will come back. And it will be here to stay. No fucked up servers. No adds. I have finished moving QB45.com, Neobasic ( and marcade.net) to a new server which is fast and reliable. I will have vacation in 2 weeks for about 6 weeks long. I plan to work on all three sites in this time. We shall see what happens. But judging by the nearly four-month period of inactivity, it's looking less and less likely that we will see anything happen with QB45.com anytime soon. It's a shame to see such a valuable resource go to waste. PCopy! Issue #50 Nov 16'th 2007: Read - .zip archive. Defining a Community. Why is Ours Lost? QBasic arguably had one of the greatest programming communities in existence. Everyone got together to do everything. People coded things and posted them and were generally congratulated, or given friendly tips, generally ignoring how terrible any single piece of code was. The single action of getting text input and affecting a single stat based on what number was given was an amazing feat - Maybe not amazing in the intuitive sense, but amazing in that it was entertaining. 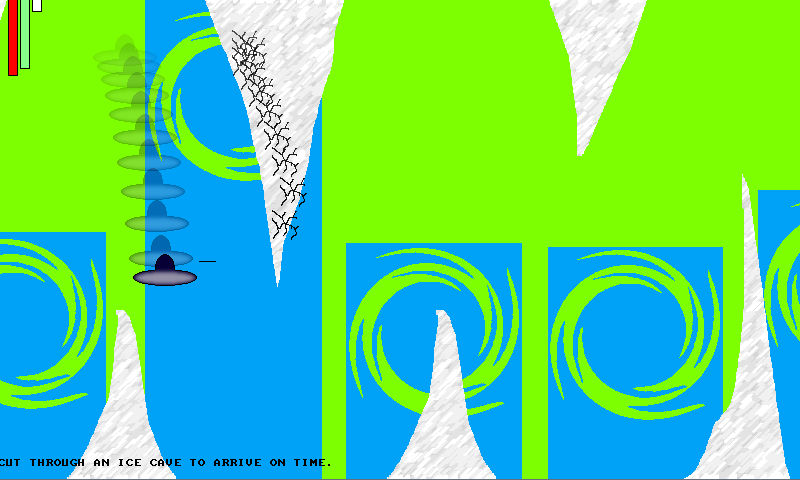 QBasic was naturally fun. Why is this though? It wasn't just the language. It was the community. Can they be related? Let's define what a community is. FreeBASIC does not have as friendly as a community as QBasic. It may have a larger one, but it simply does not feel like home to the larger majority of members. This article spurred an active discussion about the state of the Freebasic community. Pritchard's opinion that the FB scene is not nearly as "fun" or "exciting" as the old QBasic community is a popular one -- and it's one of the main reasons that QB coders give for not switching to Freebasic. Needless to say, this article is worth a read. Of special note are notthecheatr's FB n00b Tutorials, a great introduction to Freebasic programming that I would reccommend to... well... n00bs. Juan Pablo Peloso, aka "BISI Inc." has released a new QBasic RPG called "Chronicles of Galia: The First Mission," which is a a continuation of a series of QB games called simply "Adventure" 1 through 3. Jean-Pierre is back in a fully enhanced and extended version of his original Adventure! The original quest of yore has been greatly expanded upon, and it has now become Jean-Pierre's largest, most expansive adventure yet! 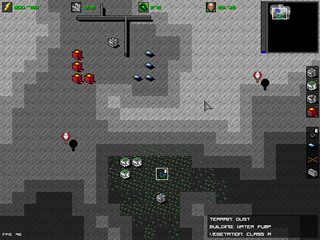 Just like the other BISI games, The First Mission was programmed using 100% QBasic language, featuring colorful VGA graphics. It's a new beginning in the series, indeed. So, here it is; the revamped beginning of Jean-Pierre's legend has finally arrived! Witness the true story behind our favorite knight's first mission! Jump into the mythical land of Galia and have fun! You can download the game and find out more about it at the official website: Chronicles of Galia. And you thought the QB RPG scene was dead! Const Qualifiers, QB compatibility updates, graphics library fixes, ported header updates, and general improvements on all platforms. Compiler development has made significant progress since the -lang dialect option was introduced with the 0.17 release earlier in 2007. Developers are continuing to take advantage of the capability to both improve the future of the language in the -lang fb dialect while at the same time providing even better QB compatibility in the -lang qb dialect. This release, the last one for 2007, marks approximately the 3 year anniversary release since the first public release of FreeBASIC. Thanks to all the users that started with us and the new users that have joined since then for their suggestions, encouragement, and enthusiasm. Apparently a demonstration game to show the power of Z!re's "Field View Engine 2" -- which is supposed to allow MMORPG / open universe games. 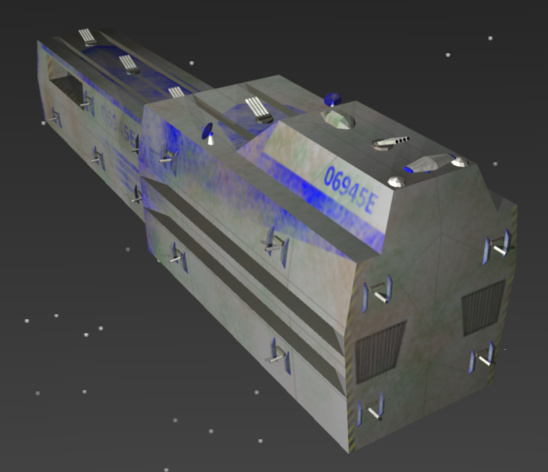 A racing game set in outer space. 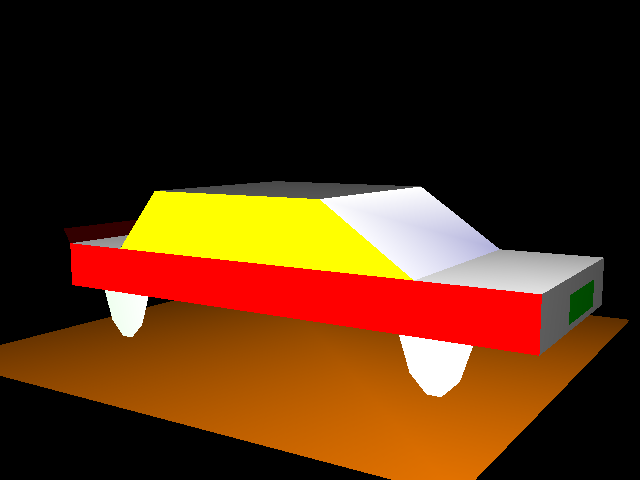 Z!re started this project because someone complained that nobody had yet made a driving / racing game in FB. Xerol has released a demo of his version of "Conway's Game of Life," complete with a video demonstration, over at his website. 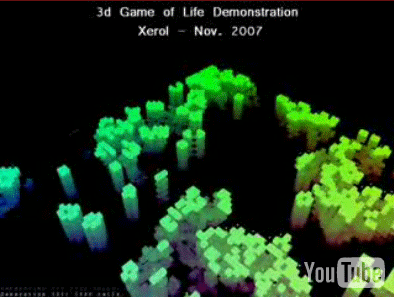 "Basically, Conway's Game of Life with the third dimension used to show successive states over time. You can download the program (and source) here." The 'QB64 Project' by Galleon is an exciting compiler project. It is an attempt at making a Qbasic-compatabile compiler that produces executables capable of running on newer operating systems, like Vista. DEMO #5 has been released and has many improvements from the last release. Keep tabs on this project; it's looking incredibly promising! 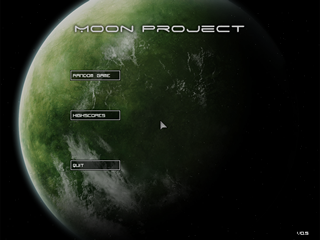 AlexZ's impressive RTS / strategy game / economy simulation Moon Project recently havd version 0.5 released. You have landed on Moon and your goal is to sort of Gaia transform it to make it habitable. You do so by building water pumps that will make plants grow who then produce an atmosphere. To build water pumps you will need to build Metal Mines, Habitats, Solar Panels and Research Centers. Habitats can only be built with enough food which is also produced by the plants, so you really need to take care what you build or you are out of ressources and you can't finish the game. Though, I've balanced it to make it very easy, so don't worry. You can find the latest version in this thread! Lachie Dazdarian is working on a new scrolling engine, which could be used as the basis for many types of games. This could come in very handy for beginning game programmers. Adigun A. Polack has been working on a new version of Aflib2 for Freebasic, that is now 97% complete. An AWESOME welcome-back and greetings to all of you splendid FreeBASIC people out there once more here, and I am so tremendously happy up front to tell you right now that AFlib2 Remixed is now 97% completed so far, with just a few more routines to go, plus an all-new documentation that I am gonna do that covers all of the routines that this newly revamped game library has to offer!!! ^-^=b ! The most exciting new feature is Pixel-perfect (PP) sprite collision detection, that Adigun says he spent four months perfecting. A newcomer to the FB scene, vcatkiller, recently released a demo of a new side-scrolling spaceshooter game called Bullet Cloud. It looks very promising. For a demo version, more screenshots and more information, visit the Bullet Cloud website. sir_mud has been busy lately with a great library project called The FreeBasic Extended Library. "The FreeBASIC Extended Library, a somewhat C++ style library for FreeBASIC providing many commonly used containers, constants and functions. FBEXT, as it is called, is modular also consisting of a minimum "core" containing the containers, error checking, debug helpers and a memory leak detector." a fully featured Sprite class with unlimited number of frames per sprite and pixel perfect collision checking with other Sprites, among others. Nodtveidt, aka Nekrophidius, aka Epona Soft has been working on his game Two Lords ever since before QB Express launched in 2004 (it was one of the first games previewed in the Gallery). Anyway, after all these years, he has announced that the game is "ALMOST FINISHED." Two Lords will likely be completed by summer. This version is still built using FB 0.14 but transition to the latest FB beta is in progress. After this version is completed, a DS port will be made. Plans for the true 3D version are still in the works, but I'm unsure if it will ever come to fruition due to lack of time and the presence of way too much competition (it seems everyone's making an FPS). A nice little scrolling engine for your oldschool game's map / overworld system. Certainly the best QB palette routine I've seen. mambazo gave himself three weeks to write a complete roguelike game. Check it out! This is a very promising isometric RPG that is in the works. I'm sure you'll be hearing about it in a future issue, but check it out now as well! 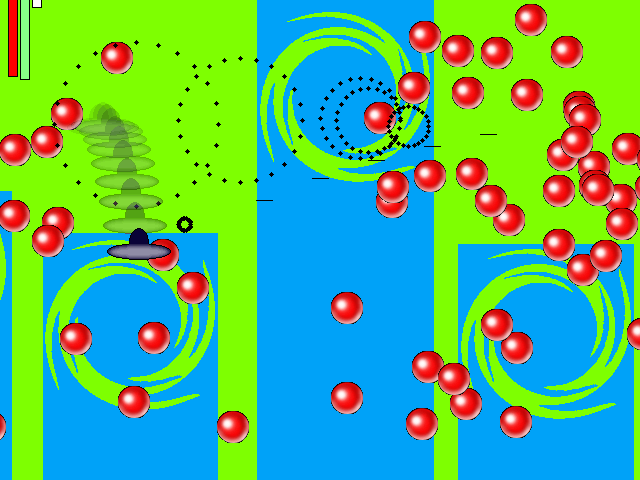 A 3D tank shooting game using OpenGL. A great 32K routine that allows you to play WAV sounds in FB without FMOD or BASS. The official site is here. 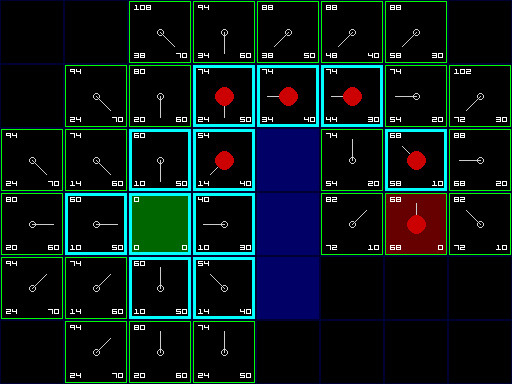 coderJeff posted a great A* Pathfinding Demo on the Freebasic.net forums in November. "You can use the mouse buttons to set the starting and ending tiles, plus toggle the solid tiles. This is an A* pathfinding demonstration written in FreeBASIC that generates a display similar to the excellent beginners tutorial by Patrick Lester found at http://www.policyalmanac.org/games/aStarTutorial.htm "
This is a fun and useful routine. Check out coderJeff's demo right here. A&F Software has released a primitive but fun game called Chuckie Egg Returns, that is similar in style to Lode Runner. The aim of the game is to "collect all of the eggs on each level whilst avoiding the swans." Simple enough! After the success of ciw1973's first wildly successful Freebasic coding competition, he ran a second one in November. The task? Create an original game using only the graphics and sounds from the original version of Space Invaders. And like ciw1973's previous competition, real cash prizes were awarded to the winners! All in all, there were EIGHT entries into this competition, and some fabulous games were produced. Congratulations to the winners, and be sure to check out all of the entries, which were recently added to the Freebasic Games Directory. The last few months, Kristopher Windsor has been churning out lots of amazing graphics demos, OpenGL demos and Freebasic games. He is as talented as he is prolific, and so this month, I am going to dedicate the entire gallery to shots from his projects. Kristopher: I hope this is okay with you, because I didn't ask you before hand! Based on the code at http://basic4gl.wikispaces.com/2D+Drawing+in+OpenGL, I have made a small library for hardware accelerated 2D graphics! It has commands similar to FBGFX's Line, Circle, Pset, Draw String, Put, and Screen, and can create textures directly from a bitmap or FBGFX buffer. It has full support for alpha blending through rgba() in the primitive functions, and an alpha value argument in g2Put(). Kristopher Windsor has made dozens of other projects in the past few years, and is one of the best FB programmers around. Got to ask ourselves a question – Where are we now? How many of us actually remember today the first years of FreeBASIC? In was the time when the QBasic community was much in the state as it is now, and the atmosphere of "moving on" and "giving up" was a constant thing. Ok, today it's more about "We are alive to spite FB! ", but nothing is really different about that part of the community. Then FreeBASIC appeared when we though nothing could bring the old spirit of the community back and the atmosphere of creativity was fully restored in less than a month. Yes, it took some of us to realize the greatness and importance of FreeBASIC for the future (cough-cough), but quite quickly all the important figures of the old community were coding in FreeBASIC. We had a constant influx of tutorials, popular 32-bit libs were wrapped for FB, and people produced programs that were way beyond "compiler feature exploring" toys. Do you remember the days of The Quest For Opa Opa, The Griffon Legend, Lynn's Legacy, and sometime later Antiman but still quite long ago? Allow me to mention my Star Cage and Poxie too. 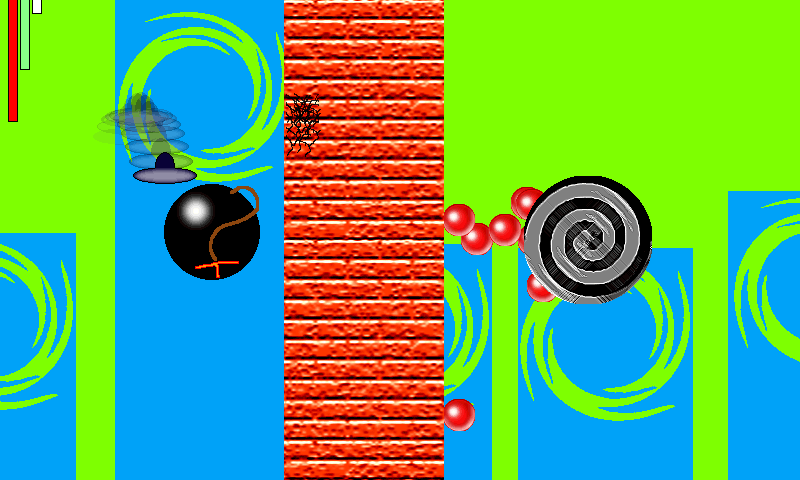 Yes, I'm recalling the games we used to make mainly because I'm interested in game design, but one wonders what the hell happened. Shouldn't have we moved on from there or at least stayed on the same place, and not went backwards (still talking about games)? And what happened to old QB legends that were here in the beginning of FB but with time disappeared or stopped coming? Where are na_th_an, relsoft, Piptol, Nekrophidius or SJ Zero. Yes, Nek comes to Pete's forum, but why not in the FreeBASIC.net anymore? Does anyone but me bother to ask why? Well, I’ll tell you what I think. We simply disregarded the community and three groups of people remained. One building and contributing the compiler, another exploring and playing with the new features and possibilities but only that, and bunch of others silently mooching from this open source project not interested on giving anything back. Not that they have to, but I don't have to like them, do I? Perhaps too many things are happening at once. Like not long ago we had HGE library wrapped for FB. 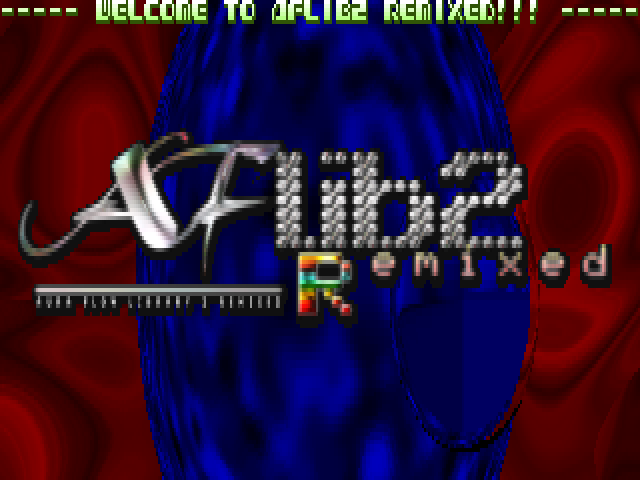 More recently FreeBasic Extended Library and Adigun's AFlib 2 Remixed were released. You can easily get lost in there, spending more time exploring those libs than actually making something with them. I wonder will ANY The Griffon Legend level project be released in ANY of those libs in the next....I don't know, 4 months. I hope my fears will be proved wrong. The other aspect of the “community problem” is of course that FreeBASIC is not mainly a game design tool. It's much more than QBasic could be and was, and therefore much more people are doing completely different things in it which was not the case with QBasic. Interests are divided and cohesion is lacking. This of course can't be changed, but one hopped some people will be motivate to create game design oriented forums/sites, or GUI forum/sites, heavily maintained, not just created. Places that will bring together people with the same interests in using FreeBASIC. I personally did try with my FreeBASIC Games Directory, but the community feedback was/is rather lacking, so one can also ask himself if such things are even desired. Most seem to be quite content with the support forum only. Maybe on the end, this turned into a programming community, and that's for me like being in a foreign land. It honestly sadness me that people don't really care that much anymore about the community. I guess they are happy with waiting and playing with the constant upgrades to FreeBASIC, getting wet with C++ structure and OOP (how did we come from BASIC to this, I ask), dream about the next big commercial project of their and do nothing for others, like comment a new FB game that usually appears once in a month. A friend of mine who agrees with my thoughts cleverly summed it by saying that the old community was about the people and not the language, and now it's about the language. So to end this incoherent and drab article in my usual style, I’ll say what I think happened - THE COMMUINTY DIED! Yes. And it couldn’t be deader. Will a never one appear, I can only speculate. I’m not very hopeful, and I’m fearful if a new appears I’ll feel like Alice in Wonderland in it. So yeah, the good old times have gone for me. A cold and uncertain future is ahead. Goodbye my community, goodbye my friendly place. You have been the one. Find a subject that interests you, and that you understand. You don’t have to know everything about the subject, but writing on subjects that don’t interest you is very hard and often doesn’t result in great tutorials(it is possible though). Always first think of what you want to reach. A short-well explained tutorial about the basics? Or an 10-pages one, that covers all the subjects details? Will you only give theory, or will you give (a part of? The whole?) code for it? Well, enough to think on. It is also important that you don’t write on subjects that have been tutorialized since the ancient times. Unless the available tutorials don’t satisfy you on some fronts, or if you want to add something to them. And of course, if you want to make a series about something, some subjects just can’t miss, and a link to someone’s other site looks a bit dull. You don’t have to know everything about the subject when you start writing, expecially when it’s only about the basics. You can search up things about the subject while the tutorial is in progress too. I often use an introduction, because you can make clear to the reader what he can expect. Also make clear if you assume some additional knowledge(about vector math or interpolation for instance) or abilities that you need to understand the tutorial or use the technique you explain. Also, you can tell how you find the subject, where you saw it first and what your experiences are when you tried to code them, and whatever you want more. But don’t make it too long, because it will get boring then. This is the biggest part of the tutorial. The important thing is here to keep the text understandable and neat. Also, try to make a clear page. Don’t write a page full of text, press enter sometimes! Always try to make things 100% clear. Read your own text. If you don’t understand your won text, other people surely won’t! If you’re having troubles in how to explain something, don’t hesitate to make a picture. 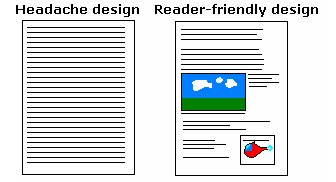 Pictures are often much better then words, and it makes also your tutorial ‘look better’, the reader will be more attracted to read your tutorial. Don’t use pictures from other people, prefer to make your own. If you steal pictures anyway, give credits and a link! But always try not to do this, keep it original! There are no syntax rules for pseudocode. You just write it in a way that it is most clear. Don’t forget any steps, just like real programming languages, you have to type everything. Of course you can point to multiple lines of programming code with one pseudocode line, but you have to do everything you would do in real programming code too(except program language specific things). If you have enough spare time, you can offer your email address and offer to give explanation or edit the tutorial if things aren’t clear. But, be smart, and don’t give your mail you use for your job or privat things as well when you expect very much mails. You mailbox may be overflowed with questions or reactions, and that isn’t nice ;). Well, while I’m reaching the end of this tutorial also, I will give some advice on the end of your tutorials. At the end, I usually make a conclusion, where I explain how you should use the knowledge you just gained. When there are different manners and techniques, I give the pro’s and con’s for every manner. I also post greets and credits if there are any. Ow, and sometimes I list some ideas that can be done with that technique. Things I haven’t done (yet) and that could be very nice. When you’re planning to write a next tutorial, you can give the reader some information where it is about. This are just some ideas, you could write everything you want, but this is what I do usually. When the tutorial is finished, you let someone else read it, to gain suggestions about grammar faults, bugs in your code and your writing style. Also, always ask if everything was completely clear and if he/she understood everything. When it’s done, you can do (or let do) the fonts etc, so it looks nice. The standard Word font is nice but too plain, so you may use other fonts (like I don’t do :P). When Lachie Dazdarian followed up his QBasic Games Directory with a Freebasic version, we all knew it was going to be good. Lachie's dedication to the QB and FB is unrivaled, and his thoroughness and attention to detail ensures that any project he works on will be a quality product. Well, the FBGD definitely lives up to our expectations. 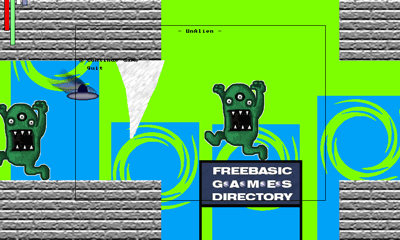 Simply put, the Freebasic Games Directory is the single greatest resource for FB game programmers available anywhere. Lachie Dazdarian has singlehandedly gathered up just about every completed Freebasic game that's ever been released, and organized them into an attractive and incredibly useful database -- complete with screenshots, reviews and a comments feature, that make the games more accessable. However, it wasn't until this month that the FBGD truly became a community of its own -- when Lachie launched a forum, that has quickly become one of the top places to discuss Freebasic game programming, and share games. 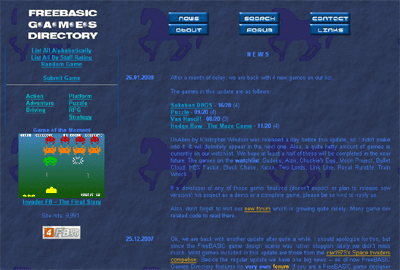 For being such a phenomenal resource and for its quickly-growing forum, the Freebasic Games Directory is our Site of the Month! coderJeff has been a contributor to the Freebasic community since the beginning, and you probably know him as one of the main programmers on the Freebasic Compiler. Since V1ctor scaled back his involvement with FB development several months ago, coderJeff has stepped up to fill his shoes; acting as the Site Admin for Freebasic.net, and also actively developing on the compiler. On the side, coderJeff has also released several projects of his own -- most recently his A* Pathfinding Test; and is working on an (Unofficial) Freebasic Manual. But what has impressed me most about coderJeff in the past month has been his dedication to making Freebasic backwards compatible with QBasic; and his activism in helping QBasic programmers bridge the gap between QBasic and Freebasic. One of the biggest issues the QB community has with Freebasic are the inconsistencies between supported QB and FB code, and coderJeff has worked especially hard to help confused programmers transition their QuickBasic code to Freebasic. For his dedication to the Freebasic compiler project, and his work to unite the FB and QB communities, coderJeff is the QB Express Programmer of the Month. We've got a pretty bare comics section this month, but luckily Sir_mud is back with a new God Object comic! 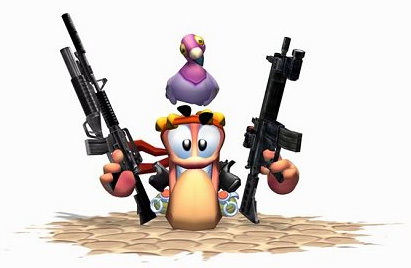 One of the great things of Worms was that the environment was almost completely destructible. You could make holes and tunnels through the whole landscape. This make some nice battle techniques possible. However, I will write more about how you can program this kind of landscapes. As an extra, I thought it would be nice to write something about scrolling and maps that are larger then the screen. I don’t know if this would work in Qbasic, it could be too slow. It is anyway a quite good way to save memory for big pixel maps and other things (I originally found this technique in a font tutorial by Jakob Krarup). 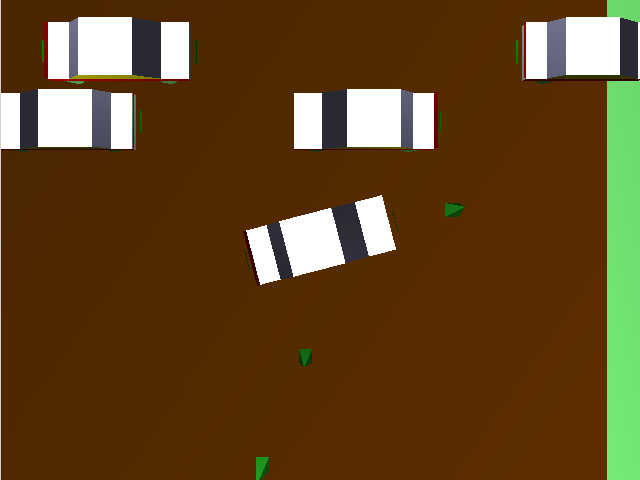 A texture for the destructible ground. Most people prefer some ground-colour for it. A brown, tiling texture is perfect. And of course one for the indestructible ground (often, metal or some metal colour is used). When the damage map hits a destructible pixel, it is removed. (I recommend round or random shapes instead of a map that leaves exact the same shape hole with every explosion). Ill call the white pixels damage pixels as they do damage. 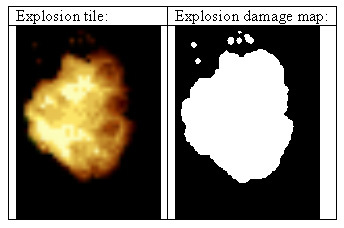 Instead of checking for every destructible pixel if it is hit by a damage pixel from the explosion map, you draw the explosion, and when on the place of a damage pixel is a destructible pixel, you erase it in the map. If you want to avoid DEF SEG (as it is not that fast), you should 1. Use a LUT to store 2. Use ASM. It is not easy but it is much faster and handles segments and such things better and faster then QB. And here is my sucking demo. 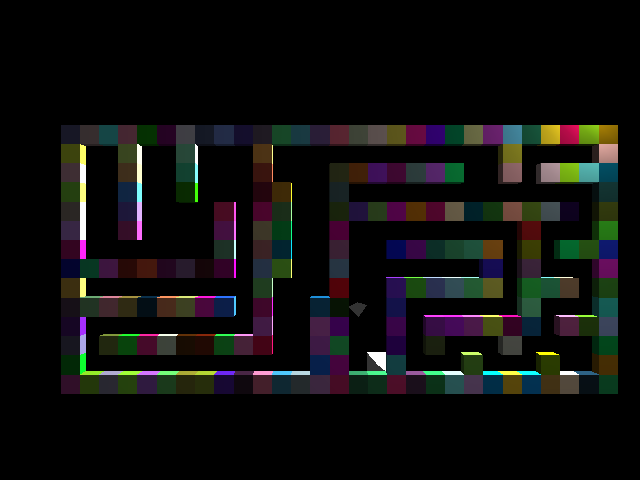 It doesn’t actually use a buffer, but just uses PSET and POINT, so it actually uses the buffer as a map. The way I would normally program it, is to make a buffer and PEEK and POKE to that. I could texture it too that way. So. 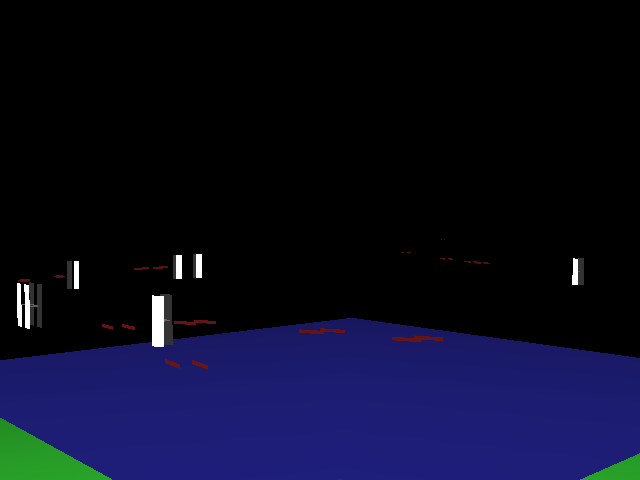 That is how you make a simple destructible terrain (I keep on typing destructable but Word helps me :D). But you only have a static, non-scrolling, boring map. Let’s make it bigger, so that we can scroll! First, though I will teach you how to actually use this map with holes. 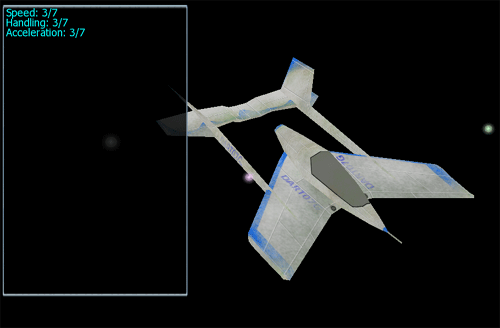 In this example you check only the pixels that are zero on the right map. You should only check the pixels that are new. New means that they are not already checked in previous collision detections. Here, the red pixels are the ‘new’ pixels. 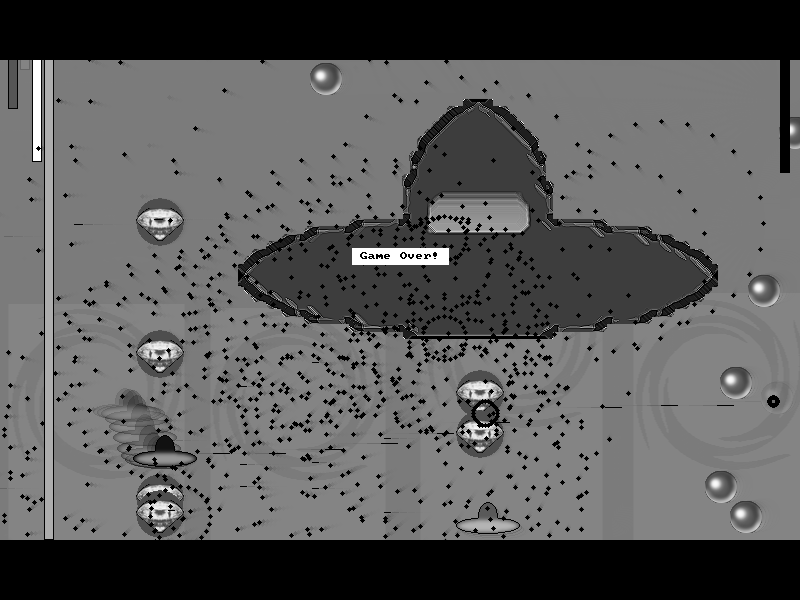 You should do collision test for the whole black area every time that a worm has gone to a completely new position (teleportation or the first time that the worms are being placed somewhere). What to do when one of the pixels is not empty? Well, you should decide if the pixel is (relatively!) low enough to let your worms climb upon it or if it’s to high for your worm. What you should do also, is checking the pixels below the worm. It has hit some (destructible) ground. You could subtract some lives either, so that the worms could die if they fall from a high platform. It is below the ground level. There are several things that you could do. You could let the worm disappear and act like it’s dead or either act just like the ground is destructible ground. So subtract some lives if the fall is high enough, and then just go on like normally. Note: This is a manner of making big scrolling maps that I don’t know if it’s easy to make it run realtime, because I haven’t tried it. In theory this technique is quite easy, but when you actually use it is becomes much more complex due to the hard access to bits. To avoid this I suggest you use some lookuptables for the bit operations. I’ve explained how to make them in this chapter. 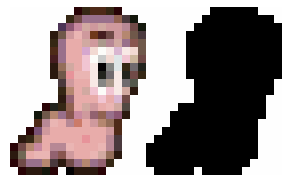 One texture for each kind of pixel. You could however make a tilemap, and paint the each pixel and lookup the texture at the tilemap, but this is somewhat hard. No un-destructible pixels. You can make these but then you can save ‘just’ four times a screen-size map in an array with screen-size. You just have air and destructible pixels else. But it’s the only way I know, else then just using extreme much memory. Now you know about this, I will actually explain how this is done. If you don’t understand the bits and byte part, read the font tutorial by Jakob Krarup, or a bit tutorial by Ximmer. But first try to understand this, because it is not so hard, and I think I explained it not so bad. Let’s take one pixel. A pixel is represented by one byte. A byte is built up from 8 bits. Bits have value from either 0 or 1. The computer uses decimal numbers to built up all decimal numbers. This is some really important stuff for in the rest of the tutorial. In this picture, all bits are ON (=1). 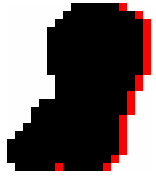 This 8-bit integer(byte) represents a value. We find it by adding all places where an one is in the above row(so if the bit is ON), multiplied by the ‘weight’ of that bit(what’s standing below there). The weight for the nth bit is calculated by 2 ^ n. We start counting for n at zero, otherwise we would not get 1 at the begin. Hey! 255, that is the maximum colour in SCREEN 13! Right. 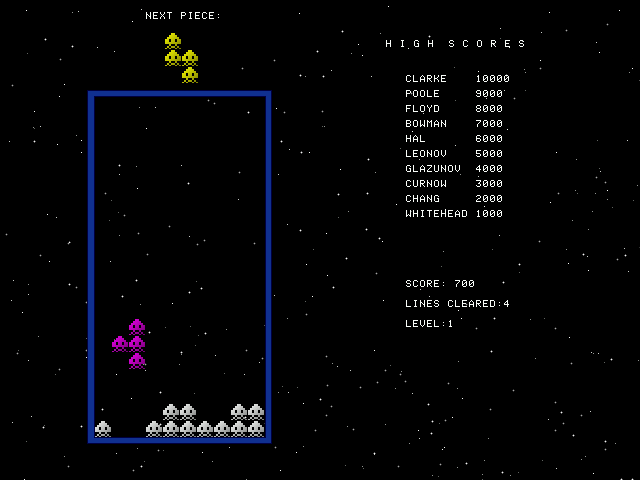 The colours in screen mode 13 are also built up out of 8 bits. 8 Bits can have any value between 0 and 255. 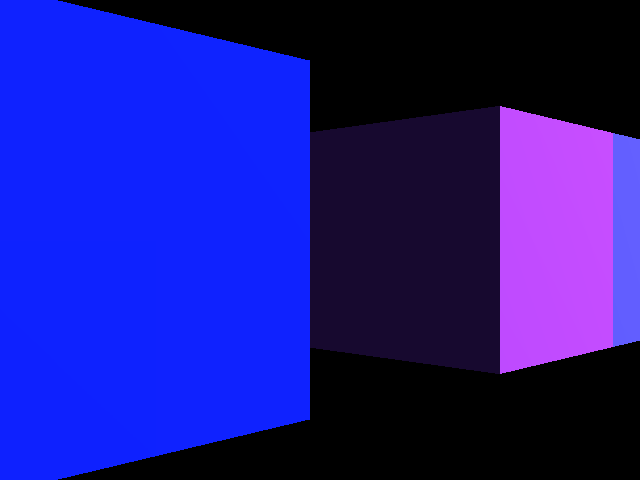 But when we want only two colours, we can do some stuff and use bits for our colour, so either zero or one. Then we have to have a way to convert the value(0 - 255) to the bit thing and back. If the value AND (I mean the AND operation now ;)) the weight of the bit is more then zero, then the bit is one. If it’s zero, the bit is off. There is some mathematical explanation for this but I won’t bore you with it. Read the bit tutorial of you want to know what AND exactly does. And another one that gives you the status of each nth bit with a certain value. Where the second is the value of the byte you PEEK’d and the first is n (so you know the status of the nth bit). Of course this LUT’s are integer. The SGN() keeps the value between 0 and 1 (or -1 if there is a negative value, but we don’t have that here). It returns 0 for 0, -1 for any negative number and 1 for every positive number. The second LUT is to do the drawing, you put the value of a byte in it, and the number of the bit that you want to know, and then it returns the value of that bit. 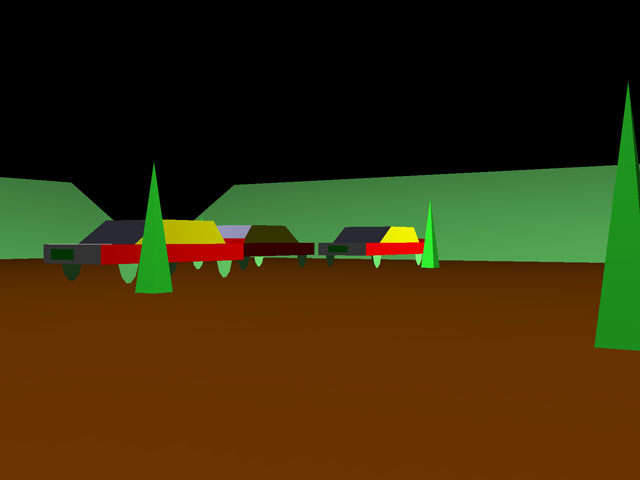 The first is to do the invert, so this is to edit the map (for example for explosions). You put the 8 bits in it, and it returns the value of the byte that it would be. Then you just POKE that in the memory at the right offset. Now when you want a scrolling map, you should use PEEK and POKE to get any value between 0 and 255, so you can look that up and change it easily with the LUT’s. I believe that you can make a bit lookuptable in FB to make things easier, but I’m not sure of that. Now one thing that may be a bit hard is to find the offset from where too start. 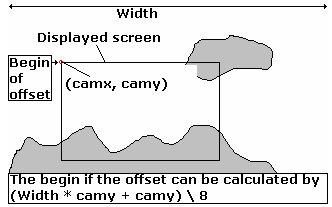 Then you start at the ((Width * camy + camx) AND 7)th bit. 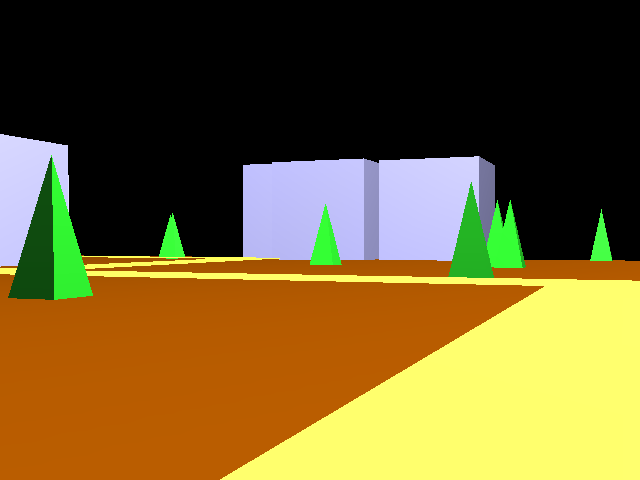 This is because at each offset, 8 pixels are stored (or 4 if you use more kinds of terrains). Then you paint the terrain, starting at the calculated offset (I just explained you how to do that), then you paint 8 pixels from the byte at that offset, then you increase the pointer by one, so it is pointing at the next offset. You do that 40 times for a screen width of 320, then you set the pointer to the start offset plus the screen width, and draw it all over again. Then you do that until you reached the bottom of the screen. When I look back at this tutorial I realize that there was a bit too much theory. This is mainly because I hadn’t enough time and motivation to cover every little thing in detail, and write the code for it. This is possible for small things like particular effects, but if you would do it for an engine (and especially ones like this, that are pretty complex) you would get something like 30 pages. I prefer a ‘light’ tutorial, that is understandable and readable and one that still covers the very basic ideas behind it. Well, enough excuses about this tutorial which isn’t one of my best in my opinion. Please give me some feedback at basicallybest@live.nl. A function is a subroutine that gives back a value. Of course, they must be declared. Also, it is a good idea to pass numbers into a subroutine via arguments. They are also very useful for modularity and using local variables rather than global. Keep in mind, this tutorial is about clarifying a subject and teaching it. This is not about the newest theory on how to construct neural paths for AI, or how to detect collisions in 5-dimensional space. This is text-book material, and neither particularly inspirational nor exciting. The first thing to do is to do is initialize the function. Let’s have a function that divides a sum of numbers by a number. It requires three arguments, and returns one number. PRINT "Error in the divisor!" Stop copying. If you don’t, you just might get an error in you’re compiler if it permits pasting. I doubt it will work in QB; most likely because I’m passing functions without parameters. For those of you with only QB, pretend that this program is running. It’s FB tested, and although it’s practically unpractical, not to mention rather inefficient, it serves as an educational tool. To start off explaining the program, and elucidate you on functions, I’ll start from the top, and work all of my way down. First thing is the top two commands. OPTION EXPLICIT and OPTION BYVAL. OPTION EXPLICIT is an excellent debugging tool. It tells the compiler to flag an error if it sees an uninitialized variable. It’s to protect against typos. It actually helped me when I wrote the code. I originally put FOR A_NUMBER = 1 TO 3 ... NEXT A. Actually, it was supposed to be NEXT A_NUMBER. Yes, it’s extra work to initialize variables without using them, but it protects from typo bugs, and initializing variables is a good habit. OPTION BYVAL tells the compiler to accept values, rather than references. I don’t know much about it, other than it solved an old bug I had. The next command is my declaration of the function SUM_DIVIDE. Due to lack of space and word-wrap, the last double moved to the next line. So for those who already copied and attempted to run the program, you might get an error if you didn’t notice this. Just move it back. The other functions and subroutines also were declared with the format of DECLARE <FUNCTION|SUB> <NAME>(PARAMETER_ONE AS DOUBLE, PARAMETER_TWO AS SINGLE, PARAMETER_THREE AS STRING, ... , PARAMETER_N AS SHORT) AS LONG. In order, declare the function’s name, the parameters with each type, and top it off with the type of the return value. You may not even need parameters, but remember to include the empty parenthesis. Such as FUNCTION GO_AGAIN( ). Next is dimensioning the main variables themselves. Notice that I did NOT use common shared. Which means that no function is messing with any variables that it shouldn’t mess with. Global variables are evil. Repeat, global variables are evil. Just like GOTO. Use them only when local variables can’t do something well. But then again, that’s what pointers are for. Now for the main body. The DO loop. The first thing in the main loop is the FOR loop. It runs three times, to get user input three times. GET_USER_INPUT( ) does what its names says; it gets the user’s input. And the FOR loop stores it to an array. The next thing that is done is loading the list into the function SUM_DIVIDE and then storing the answer to the variable ANS. Then the variable is displayed and the user is asked if he or she wants to try again. For those of you who are new to programming and/or Boolean logic, you might have noticed what I did to end the WHILE loop. I put WHILE TRY_AGAIN. This is not a typo. I don’t have to put WHILE TRY_AGAIN = 1. The computer assumes that as long as TRY_AGAIN is not zero, it is true. Onward, to the homeland of functions and subroutines. First on the line, the almighty Function FUNCTION SUM_DIVIDE itself. Here’s the purpose of the program. It doesn’t matter where you put it. Okay, there are limits. But why on earth would anybody declare it in a FOR loop? It will still take its arguments and spit out a brand new number, if it’s properly declared and there aren’t any bugs or typos. I’ll let you figure out the other functions. You might have noticed that I put the same function GET_USER_INPUT twice, with different parameters. The second function with the extra parameter that just returns 42 (why not?) is called an overloaded function. It’s a neat trick, though useless in my program. The overloaded function (which must go before the original) has a different set of arguments. The reason for this is that sometimes you might want to put these numbers in a function (ex: all double), and other times you want to input strings. And you want it under the same name, but different ways to process the numbers due to different natures of the numbers. You don’t have to do this, but it looks cool and has practical applications. Oh, and subroutines can also take parameters. It keeps the variables local, but “transports” them through arguments and returns (for functions, subs don’t return anything). Here’s an instance for using functions and subs. Use a subroutine that takes six parameters – the x and y coordinates for a triangle – and print them. 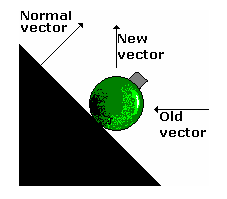 Use a function to move the vertices. That’s all I have to say about functions. So if you see F(x) = x² + 4x + 5, you know that you can plug it to the computer. If you have any comments or questions, open your compiler and press F1. If you have any further comments or questions, about this tutorial, please find a way to ask me. Hopefully, I can answer any questions. Thank you for giving my tutorial some interest. Every programmer dreams of their program turning out the best it can be, after say,.. about 200 revisions.. you have something that looks like a finished piece. I say 200 revisions, cause I like to save alot. When your main module grows to the biggest it can be, you become limited by your program's own use of defined arrays and variables verses the length of the overall code. One of the tricks I came up with when programming in a strict structured language like Turbo Pascal, was to define an array of 100 intergers, 100 strings, and use those as my variables. That way, instead of defining a name for every variable, if I commented my use of the arrays well, I could tweak the code rather trouble free. 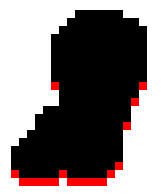 Well, that is our achille's heel in QBasic. We are free to make as many variables as we want, even if we are unaware of how we make unnecessary duplicates of the same variables, only with a slightly different name. That's where string variables encoded to shuttle groups of values can help keep your string usage to a minimum. Using a simple scheme to encode values and string entries into one long chain, we can use a few routines to pull the data off or check against the data and create markers to grab data further down the chain. '<> Count number of elements by counting the separators. TmpStrg2$ = NewStrg$ + ";"
GridDelta$ = TmpStrg2$ + ";"
'<> Does the left piece of the expression match? '<> Check for a combined entry..
TmpStrg$ = TmpStrg$ + GridMultiVar$(InStrg$, Nul) + ";"
'one so we can start a new chain, or analyze it outside the longer chain. 'Pull out a single numeric value from a chain. '<> Pull out a single string value from a chain. 'The complex stuff near the end is correction for chr$(0), chr$(32).. etc..
'Convert something encoded into ASCII back into Decimal using MID$.. blah ..
'Take raw HEX and make them VAL() compliant for turning into values. vert4$ = LTRIM$(STR$(in)) + ";"
'Make a numeric that can be added directly to a chain. vert5$ = RIGHT$("000" + LTRIM$(STR$(inval)), 3) + ";"
'Create a visually pleasing numeric string from a value. 'Used for showing counters and values on screen. 'SHARED MouseX,MouseY ' global variables -- of course we assume this..
'Example of a heavily used routine of mine to check mouse position. MouseOvr$ = "CTRL4;" + RIGHT$("000" + vert$(xat), 3) + ";" + RIGHT$("000" + vert$(yat), 3) + ";"
This method of using strings to move multiple values, string elements, and combined values does have disadvantages of course. It relies heavily on slow cumbersome commands to switch back and forth between numeric and string, and is partially recurvsive when used all at once. Of course this is a modest attempt to move data efficiently, but I think it has at least some place in programs. One very clear point of doing this is the small footprint that the code makes in the string space. As the values come from a SUB to the main module on returning the results from processing, or sending a multitude of data to a SUB, there is one big thing lacking. Variables. Instead of using variables to hold the resulting values, you can directly plug in the FUNCTIONS into the target code. Plainly speaking, the largest volume of dynamic variables are the strings that contain the data chains. Instead of defining global variables to accomidate every SUB or FUNCTION or otherwise, all the data can be packed neatly into a chain that the target routine can then decode and assemble all the information it's working on processing for you. Of course there are local static variables in every module that must remain, but the global variables are cut back significantly. I have modified many of my more complex routines to accept data chains instead of a multitude of variables. Another plus of using this to send data is the ability to send LESS DATA TO YOUR ROUTINES. Using some simple logic to parse the data chain, your routine can check for more commands emebeded in the chain to react to and operate on. Of course, you cannot omit variables from a SUB or FUNCTION, unless you are Houdini, but you can create a data chain that is quite short, or really really long, and make your routine work as easy or as hard as you want it to. If you have a very complex routine that functions on many different levels of complexity, you can use this to make your routine accessable to beginners using your routine at first. The basic premise of this entire slew of command encoding came from rewriting a QBasic ANSI parser to operate as a language to draw graphics, similar to RIP graphics. One of the drawbacks of using my code is, the marker that separates the data is an ascii character, so if you encode data as raw ascii, you might accidentally put in a marker without trying to. You will have to use MSB / LSB to split your data up into nibble sized pieces and double the length of your data chain, but the end result is in your hands ultimately. The trick of QBasic, is to utilize memory in a cyclic and recyclable fashion, to make use of every ounce of free space either fine tuned to a few extra lines of code, or move the most data with the least stress on the overall memory usage. I hope this comes in useful to at least a few people. Pete's QBZine is the most creative endevor I have seen! This tutorial includes coded algorithms in Microsoft QuickBasic 4.5, and therefore the code may not apply to other programming languages. The term rounding encompasses several methods for converting numbers to a lesser precision. Rounding methods are also referred to as rounding modes or rounding rules. Converting numbers with decimals to whole numbers. Converting numbers with three or more decimal places to dollars and cents with two decimal places. Converting numbers to a workable value, like PI of 3.14159265 to 3.1416. Converting numbers to tens, hundreds, thousands, etc. for reports or charts. To adjust numbers to fit a format using a rounding mode. The FORMAT determines how the rounded result appears. Numbers with N number of decimal places, where N can be zero. Numbers expressed as hundreds, thousands, millions, etc. The ROUNDING MODE determines whether to round up or down, truncate, how to handle midway digits like .5, and how to handle negative numbers. 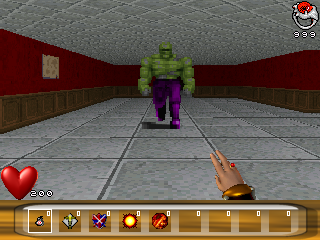 The programmer decides on the FORMAT to be used, and performs the required ROUNDING MODE algorithm. Depending on the FORMAT, the programmer may need to scale the number before and after invoking the algorithm. Negatives get rounded toward zero, i.e., to a greater negative number. Positives get rounded toward zero, i.e., to a lesser positive number. Negatives get rounded away from zero, i.e., to a lesser negative number. Positives get rounded away from zero, i.e., to a greater positive number. Both negative and positive numbers are rounded towards positive infinity. Both negative and positive numbers are rounded towards negative infinity. You will hear Round-Toward-Nearest or Round-To-Nearest referred to as a rounding mode, but it is only a rounding category or generic concept, and not a precise rounding algorithm. Round-Toward/To-Nearest, as a concept, encompasses several actual rounding algorithms; such as, the symmetric and asymmetric variations of Round-Half-Up, Round-Half-Down, Round-Half-Even, etc. From a programming point of view, Round-Toward/To-Nearest by itself is worthless. Aka Round-Half-Up-Symmetric, Half-Adjusting, Conventional Rounding. Negative numbers, whose decimal value is greater than or equal to .5, increase towards negative infinity. Others are truncated. Positive numbers, whose decimal value is greater than or equal to .5, increase towards positive infinity. Others are truncated. This is the classic or conventional rounding mode which many of us learned in school. A rounding factor of .5 is added to the number to be rounded, and the fractional part of the result is truncated. In the case of a negative number, the same operation is performed on the absolute value of the number. Both negative and positive numbers increase towards positive infinity when the decimal value is greater than or equal to .5. Aka Round-Half-Even, RoundTiesToEven, Unbiased Rounding, Convergent Rounding, Statistician's Rounding, Round to Nearest Even, Round to Even. Some people learned this mode in school. Similar to Symmetric-Arithmetic, with the exception that halfway values of .5 are rounded towards the nearest even digit. The theory is that this more or less evenly distributes upward and downward rounds of exact halves, which might reduce the overall error in a computation that involves many roundings. or alternate method using integer divide. This is the simplest rounding mode. All digits, usually the decimals, beyond the number required are dropped. The result is a number whose magnitude is always less than or equal to the original value. For POSITIVE numbers, perform ROUND-FLOOR. For NEGATIVE numbers, perform ROUND-CEILING. For POSITIVE numbers, perform ROUND-CEILING. For NEGATIVE numbers, perform ROUND-FLOOR. When "UP" means heading towards positive infinity, perform ROUND-CEILING. When "UP" means an absolute value heading away from zero, perform ROUND-AWAY-FROM-ZERO. When "DOWN" means heading towards negative infinity, perform ROUND-FLOOR. When "DOWN" means an absolute value heading towards zero, perform ROUND-TOWARD-ZERO. Discard any unwanted digits, usually any decimals. OTHER OBSCURE ROUNDING MODES NOT DISCUSSED HERE. Round-Toward-Nearest, ties away from zero. CINT or CLNG: The manual says: "Converts a numeric expression to an integer (or long integer) by rounding the fractional part of the expression." Not stated, but the rounding mode used is Bankers' Rounding. INTEGER DIVISION: The manual says: "Before integer division is performed, operands are rounded to integers or long integers..." Not stated, but the rounding mode used is Bankers' Rounding. Integer Division does a 3 step operation. 1) It rounds the dividend using Bankers' Rounding. 2) It rounds the divisor using Bankers' Rounding. 3) It then divides the dividend by the divisor, and then TRUNCATES the result toward zero. Due to the divide, a "division by zero" error is possible. INTEGER ASSIGNMENT: While transforming the floating point expression to an integer, it performs Bankers' Rounding. The INT function: The manual says: "Returns the largest integer less than or equal to the expression." The INT actually performs a Round Floor type of Truncation, also referred to as Round Toward Negative Infinity. PRINT USING: The manual says: "Numbers are rounded as necessary." Not stated, but the rounding mode used is Symmetric Arithmetic Rounding. Note: when rounding a negative number, like (-.4), Print Using will display a "-0". 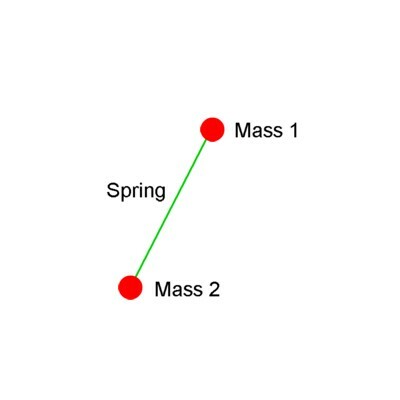 Hello everyone and welcome to this FreeBasic tutorial on spring simulation, or more exactly mass-spring-damper simulation. This is still somewhat of a rough draft covering the basics, and I intend to refine it and add some more stuff. Please do post a comment if you feel like it! This is definitely not intended to be a physics lesson. In other words I'll keep the strictly scientific part at a minimum and focus on how to implement pysics in code rather than do a lengthy and boring lecture on mechanics. This is a very common way of doing it, and even in very advanced simulations it is most likely done in the same way. You can do this in one, two, or three dimensions depending on your needs, but the physics behind it is still the same. Every object in a state of uniform motion (moving or at rest) remains in that state unless an external force is applied to it. The relationship between an object's mass m, its acceleration a, and the applied force F is F = m * a. For every force (action) there is an equal and opposite force (reaction). 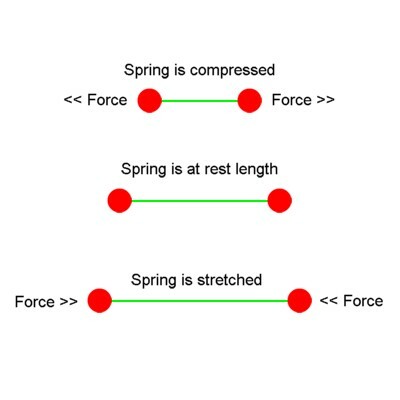 The spring stiffnes constant is simply an arbitrary positive number which defines the springs hardness. A low value gives a soft, rubbery spring, and a high value results in rigid, steel-like behaviour. According to Newton's 3rd law each force is accompanied by an equal opposite force, hence the terms "Force" and "-Force" in the equations. Where a = acceleration, dv = delta velocity (change in velocity), and dt = delta time (time step). Delta time or time step is simply a positive numerical value which decides how fast the simulation runs. Smaller values result in a slower but more accurate simulation, while bigger values means faster simulation speed at the cost of acccuracy. Where dx = delta position (or change in position), v = velocity, and dt = delta time. So, finally we've come all the way from spring deformation through force, acceleration, velocity, and to the resulting new positions of the spring endpoint masses! And now I think it's time to look at an example program. Here is a simple one dimensional spring simulation which implements what we've gone through in the above. Play around with it until you feel comfortable with the principles that makes it work. Also, try to find the limits of the simulation. For instance, try to find the highest acceptable time step and spring stiffnes values. Locate 2, 2,:  Print "green = constant"
Locate 4, 2,:  Print "white = variable"
Locate 8, 26:  Print "------ SPRING DATA ------"
Locate 20, 7:  Print "------ MASS 1 DATA ------"
Locate 20, 45: Print "------ MASS 2 DATA ------"
In the next part of the tutorial we'll go 2D and look further into the mysteries of friction and damping. This tutorial was originally posted at the Freebasic.net Forums. Welcome to the 4th part of the series on File Manipulation. It's been a while since I last wrote about this subject. After exchanging a few emails since way back then with a few people about the subject, it seemed that alot of them wated to build on my binary file example. Let's first do a little trip down memory lane and tell you what the first three parts were all about. In this first part I talked about what sequential files were and gave you the code to create a sequential file that held book related information. The code provided read information from the sequential file at the end I gave the code to create the data file itself. In this second part we covered random access files and what they are good for. We created an example that allowed you to manage a list of contact information that used random access files as it's storage media. In this last part of the series we talked about what binary files were exactly, what role they play and how they worked. We created an example that essentially created a storage system that could be defined at runtime and later retrieved. In this 4th part of the series I will be extending the last example in 3rd part by giving the database structure we created some indexing features so that you can create indexes to present the records in any order you need for the same of your project. We will give our structure the ability to have index references so that al relative indexes can be loaded in one shot and used accordingly. So let's get started shall we? Smaller files to handle when the time comes to sort them. Since records are sorted you can use algorithms to search for a specific records instead of looping through them until you find the right one. Increased search speed. Not just because the files are smaller or you can use algorithms to do searches but because index operations are typically done in memory, not on the data file itself except when you need to lead or save the index file. This last feature we will detail later in this tutorial but for now, what would you say if I told you that in that 35,000 record database, you could find any record located anywhere in the database with 20 comparisons maximum? if you didn't use that you would have to loop through the index records and compare each field in the index with the search criteria which could mean 35,000 IFs in a loop if your record happens to be the last one in the index file. I'll teach you the method later in this document. In a typical index file there are only two fields to worry about, the record number or file position and the field value that will be used for comparison later in the search operations. So in our example database file we created in the 3rd part of the series, if we want the database indexed on the employee's name, the index file would have the record number and the employee's name as actual fields. The question is now what else is needed in order to make this index functionality within our database structure. Of course this will help us know exactly which file to either look for to open the index file or which filename to use when we generate this index file. We need to know this so that we know which field to compare when we go about doing the search algorithms later. This will be stored in our database structure and controled outside the index file itself. There's two possible values here, Ascending sort which sorts from A to Z and the Descending sort which sorts from Z to A.
Ths will be in our DBHeader structure it will be a simply byte field that will have either 0 if there are no index files or the total number of index files that are to be opened. The main thing to remember here is that index files are best stured outside the main data file because it gives the main data file more room for extra records this way. Now, with all this information at hand we will be able to modify the code in the 3rd part to allow it to hold and manage index files pretty easily. With all this in place we create some arrays and variables to work with these user defined types. Below you'll see just what I added, for the original code you can refer to the included source file in the third part of the series above. Here are the variable declarations we'll need. Now,, just like we created an AddField() subroutine to save lines when defining fields for are DBFields() array we will also create a subroutine to add index to our DBIndexes() array. In our example we'll create two indexes but keep in mind you don't always have a fixed number of indexes to deal with, so using an array can become essential in these situations where you don't know how many items you're dealing with. Here's the subroutine to add index definitions. At this point our database definition is saved to the data file and our record ofset is calculated accordingly. In our example we'll add 4 records to the database just so we can see a good difference later when we display them. To do so, we'll basically populate our CurrentEmployee structure with values and save it to the data file. Here is the code to do that. CurrentEmployee.Address1 = "I don't know"
CurrentEmployee.Address2 = "And I never will"
CurrentEmployee.Address1 = "Ain't got a clue"
CurrentEmployee.City = "South of North"
CurrentEmployee.HourlyRate = 38.5   ' more than fair on salaries. CurrentEmployee.Address1 = "Am not saying"
CurrentEmployee.Address2 = "Highway To Hell"
CurrentEmployee.HourlyRate = 48.2   ' more than fair on salaries. CurrentEmployee.Address2 = "But I don't"
CurrentEmployee.HourlyRate = 58.6   ' more than fair on salaries. This loop populated both our index arrays with elements, you can see that since we're using binary files the record positions are calculated as the offset of the first record plus the record number times the length of a record. Right now the arrays have elements but they are not sorted in the order they need to be. The code that follows sorts both arrays so that records will be in the intended order we'll need. The index files are now created and sorted accordingly and held in their respective arrays. Though you could wait until later in the program to save them let's save them now so that they are saved and we don't have to worry about them. But at this point the index arrays are now ready to be used by the program. So let's save them with the following piece of code. WorkIndex = RTRIM$(DBIndexes(1).IndexName) + ".IDX"
WorkIndex = RTRIM$(DBIndexes(2).IndexName) + ".IDX"
Let's now program the display routines. We will first display the records in the order they were saved in the data file. Then, we will display them in alphabetical name order from A to Z and finally we'll display them in hourly rate so you can see that the index arrays are as they are supposed to be. Here's the code to display the records in all three mentioned orders. PRINT "NATURAL ORDER IN THE DATABASE:"
PRINT "RECORDS SORTED BY NAME:"
PRINT "RECORDS SORTED BY HOURLY RATE (Bigger to smaller rate):"
There you have it, the way it works is that in the case of the indexed views (the last 2 loops), instead of looping through the database file, we loop through the index arrays and position the pointer in the data file to the right position as it is stored in the index array (the RecordNumber field of the user defined type). When the pointer is positioned we simply load the record and display it and repeat this for each element of the array. Below is a sample output of what you should see when you run the program. As you can see the indexed record are exactly in the expected order. There is one more thing to cover in this tutorial. How to search for a specific record in the data file. OF course the first and oldest method of finding a record is to browse through the index and compare the values. something like the following accomplishes this quite easily. This will loop until it finds the record represented by the SearchValue string variable. If it find it it will display it on the screen, if not, nothing gets displayed. This is great for rather small data files or if you need to perform a specific operation to each record of the data file. But what if you had a huge data file (maybe 500,000 records of information). A loop like the one above can become long and cumbersome to execute just to find a single record. There is a better way and yes, we are about to cover how it works. Let me described to you a search algorithm called the dichotomic search. A Dichotomic Search is actually quite simple in concept. It's only prerequesite is that the array of indexed values being used are sorted alphabetically or numerically (when dealing with numerical values). The general idea of a dichotomic search is what's called a divide and conquer algorithm. Imagine you have a list of 30 alphabetically sorted employee name and you want to find one of these names in particular. What we did here is assign the upper and lower limits to the upper and lower bounds of the array. The aim of this search is to start at the middle of the list and start comparing. The IF statement I added here will make it so that if we have an uneven number of elements (say we have 31 names instead of 30) the current variables will get the value 16 which is the element in the exact middle of the list when you have an uneven number of elements in the array. At this point we are ready to begin our search loop. We start by testing the current element to be sure we do need to go into the loop or not. Then once in the loop we cut the list by halves on every itteration by changing either the lower bound (if the search value is greater than the current field) or the upper bound (if the search value is smaller than the current element) and positioning our Current variable to the middle of the new range of elements. Take a look at the code below and I'll explain it after.
' there's no need to go in the loop so we skip it.
' lower than the search value being compared.
' which means the record was not found. In order to explain what exactly is happening in this code, I will give you a sample run so that you see how everything works together. We will use our list of 31 elements as an example. Let's assume the record we are looking for is in position 30 in the list. As you can see from this table we found our record in 5 comparisons (including the original position we started in). In the traditional approach we would have had to loop 30 times in the data file to compare each record in the data file until we find a match. In a 31 record data file we saved 26 comparisons. Imagine if we had a 5000 or 500,000 record database, imagine all the comparisons we would save in a data file that size. I won't let you figure it out, any records in a 500,000 thousand records could be found in 19 comparisons or less. You would save 499,981 comparisons if you happen to be looking for the last record in the database. Imagine the speed gains from a system like this. There are a few things to consider when reading this tutorial and/or attempting to use the included sample source file. These are recommendation in order to help you make the most out of this code and make adapting the code to your project's needs that much easier. This means that when you add a record to the data file itself you'll need to be sure to add a corresponding record to each of the maintained index files. This can be done on each file write to the data file or in bulk when exiting the data entry module for example. Likewise, if you delete a record from teh data file, you need to delete it's corresponding index file record in all index files. This is more of a balancing act rather than a rule. There'something about open and closing files the least amount of time possible. There is also a recomemndation that states to open a file for the shortest time possible. The balance between how often you open a data file versus how long you open them for make up this recommendation. Sometimes it makes sense to open the fil and keep it opened, other times it makes more sense to open the file, do your work on it and close it right back up. In the case of this tutorial we knew alot of factors about the database system we created, not every database situation will give you these upfront like I did here. The code is already mean to use LBOUND and UBOUND wherever possible to adjust if you add more indexes or fields to the definitions but just to be sure use them unless you're 100% sure the current set values will not change in your proejct ever. This should mean that it will work fine in QBasic, QuickBasic 4.5, QuickBASIC P.D.S. 7.1, VB-DOS 1.0 and quite possibly FreeBasic (in -lang qb mode). To have this code work in FreeBasic's native mode you will need to remove the CALL in my subroutine calls as well as changing RTRIM$ to TRIM$ and the rest should work as expected. When would you need something like what I explained in this document? The answer might actually be quite surprising. When you mention databases people automatically think business applications, reporting, Oracle, SQL Server and other database engines like MySQL, PostgreSQL and others. 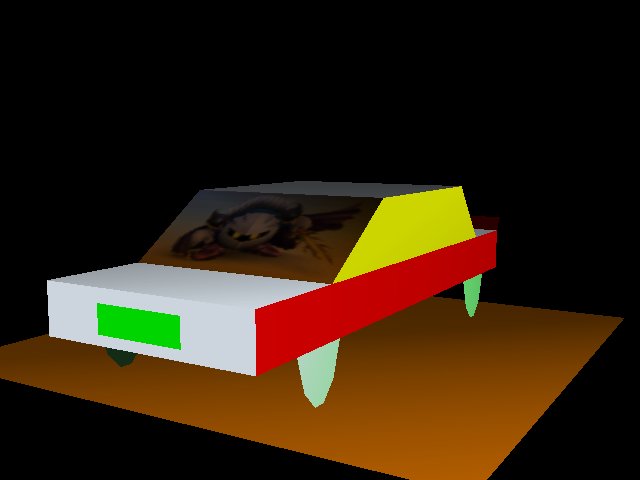 Depending on the type of 3D game youre making, having the ability to move around a file of object definitions for example might prove quite useful especially in games that need to update an environment according to other given sets of parameters. There are other game and tool/utilities that can probably benefit from a good database system like this one too. Maybe you can think of some of these projects already. The bottom line is a database system with good indexing and search algorithms have been used thousands of times in places many people never would imagine and might be more useful even to game designers than expected. Needless to say the subject coverred here is a more complex one by definition. It's quite possible that not everything listed and explained here might have been crystal clear. A few other things could be coded in order to create a really complete usable system as well. But I blieve this will definitaly put you in the right frame of mind. However, if anything is unclear, feel free to email me about it. I will then do my best to make it clear for you so that you know everything you need to know to start your database related project. Until next time, happy coding, reading, and database indexing. This tutorial should introduce you with basics of using FMOD in FreeBASIC programs. It's pretty much the summary of FMOD subs and methods I use in my projects and does not represent the entire scope of FMOD in FreeBASIC. If your needs extend beyond this tutorial, you are encouraged to explore additional FMOD calls and its documentation. Originally I planed to write a cross FMOD/FBSound tutorial, but as FBSound felt rather user-unfriendly to me I gave up on that. If someone likes and prefers FBSound, be so kind to write a tutorial about it in the style of this one if you wish to popularize the library in question. FMOD is a 32-bit sound library for Windows, Linux and Macintosh. It is free of charge for freeware products, but if you plan to use it in commercial products you'll have to buy a specific license. Visit www.fmod.org for more info on this. Well, you need FreeBASIC first. I assume you have one. As the code in this tutorial was written in FreeBASIC ver.0.18 or later, get that. After this we'll declare several variables that will become necessary later. PlaySound will be used to flag if FMOD functions should be used or not (if FMOD initiation failed), sample array will hold the sound effects and declare it like I did. number_of_sound_effect represent the number of sound effects you'll use in your program. Change this number to suit your own needs. music_handle will flag the current music track in memory which we'll stream. I advise streaming music files instead loading all of them into memory. SFXVolume will flag the current sound effects volume, while MusicVolume the music volume. PlaySound is set as TRUE by default, and then it's set to FALSE if FMOD fails to initiate. The first parameter in FMOD_Init is mixrate in Hz, usually set to 44100 as most sound files have that mixrate. The second parameter is the number of SOFTWARE channels available. I added one more channel on the number of sound effects I’ll use because I need one more for my music track. You can put any number here, just make sure it's more than the number of sound effects and music tracks you'll allocate at the same time in your program. The first parameter flags the sample slot (index). FSOUND_FREE chooses an arbitrary one. The second parameter is the name of the sound file. You can load MP3, WAV, OGG, RAW, and other file formats with this function. With the third parameter you can set the mode for that sound effect (check FMOD documentation for the description of available modes), fourth one flags the offset inside the file, and the last one flags the length of a memory block for that sound effect. Unless having special requirements, use zeros for those parameters as I did. I use 4 steps volume but you can use more. In my method 4 represents maximum volume, 3 is 75 % of maximum volume, 2 is 50 %, 1 is 25 %, and 0 is mute. Be sure to declare this subroutine. FSOUND_Stream_Open opens a sound file for streaming. The first parameter flags the sound file (string), the second parameter flags the mode of streaming (how the file should be played; refer to FMOD documentation for more info on this), and the last two parameters are 0 by default and flag the offset and length of a memory block for the streamed sound file. FSOUND_Stream_Play starts streaming the file flagged with music_handle. I used channel index 1 because we'll use the same to control the volume of the streamed music track (a way to divide the volume of sound effects and music). Note how I used MusicVolume to set the volume of the streamed track (255 max, 0 mute). FSOUND_SetVolumeAbsolute sets a channel volume linearly. This function is NOT affected by master volume. It is used when you want to quiet everything down using FSOUND_SetSFXMasterVolume, but make a channel prominent. I recommend you to stop streaming a file before you change it to another one. If you are more imaginative, you can come up with volume fade in / fade out effects when tracks are changed, but I don't want to complicate this tutorial with that. Note how the sound effects volume is set every time a sound effect if played, and how in the same time the music volume (channel 1 volume) needs to be RESET. PRINT "PUSH ESC TO END PROGRAM"
PRINT "PUSH 1 AND 2 TO TEST SOUND EFFECTS"
PRINT "PUSH F1 AND F2 TO CHANGE THE WATER SOUND VOLUME"
Use 1 and 2 to test the two sound effects, F1 and F2 to change the music volume. I've been told that using FSound_Update is not necessary, but heck, it doesn't hurt. Note how FSound_Close is used before the program ends. Always be sure to close FMOD when you end your program. Few more statements I want to show you. Note that the first parameter is the channel, so this will work only if you are streaming the music track in that channel. And this should cover the basics. Anyway, this is just the surface of FMOD. I warmly recommend you to explore "fmod.bi" and FMOD documentation and expand on these basics. That's it for another fantastic issue of QB Express! I hope you enjoyed it. Like I said in the opening letter, I'm going to do everything I can to get QB Express back on its regular once-a-month release schedule. Everyone likes it when issues come frequently and on a regular schedule, me included. QB Express will return to its former glory! I am going to force myself to make time for QB Express this month...and I hope you will do the same. Write something! If we all do just a little bit, this magazine will just get better and better. ISSUE #27 DEADLINE: March 1st, 2008. As always, please email your submissions to qbexpress@gmail.com. We're looking for all kinds of content, but what would be especially nice would be some EDITORIALS, COMICS and GAME REVIEWS -- something that has been lacking for the past few issues. And be sure to send news briefs in as well! Copyright © Pete Berg and contributors, 2008. All rights reserverd.